The Rolling Stones Song of the Day is- Let’s Spend The Night Together. Released in January 1967 as part of a double A single with Ruby Tuesday- Let’s Spend The Night Together would be on the American version of Between The Buttons. 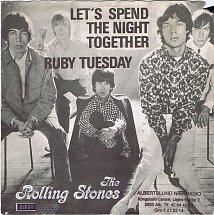 Ruby Tuesday in the US went to #1- the controversial- isn’t it hard to believe here in 2019 that Let’s Spend The Night Together was controversial?- stalled out at #55 mainly to the sexually charged nature of the lyrics. It did go to #3 in the UK. When The Rolling Stones appeared on The Ed Sullivan Show- Ed told Mick “Either the song goes or you go”- a compromise was reached they’d change it to “Let’s Spend Some TIME Together”- when they sang it on the show- which they did with Mick rolling his eyes! When they were done with the song- the Stones returned to the stage dressed in Nazi uniforms with swastakis and were ordered back to their dressing rooms. Sullivan would later announce The Rolling Stones were banned forever from the show- but they did appear again in 1969. Let’s Spend The Night Together did go to #1 in one country- Germany. David Bowie would do a glam cover of the song on his Aladdin Sane album in 1973. I had heard about the Ed Sullivan show story but hadn’t heard the Nazi uniform part. Funny it sounds like the rest of the band kept screwing up and saying the right lyrics, at least that what it sounds like. I knew exactly what you did- about the lyrics but not about the nazi uniforms- they came prepared! Hans do you mind if I reblog this one tao-talk? It’s among my many favorite Stones songs, and I even like Bowie’s cover. OK folks, remember when there were just 3 TV channels and Ed Sullivan was a TV God? Look at this Clash of the Titans! Charlie Watts. He kills me. He is cool as a cucumber…always. Never been a big fan of either. But will admit that have some great talent. Like most Stones albums, Satanic Majesty is a jewel, and it expanded horizons. The fact it was a reply to a Beatles album reinforced the dynamic effect in R&R and on pop. Really about Jim Morrison? What’s the scoop?? :::cheering::: Did not realize Ed Sullivan was such a censorship Nazi!